The factors in the model are usually created using pricing, fundamental, analyst estimates, and proprietary data. I will only show examples of factors using pricing and fundamental data because these infromation is readily available from Yahoo Fiance and ADVFN. You can see a pronounced seasonality in the Quarterly EPS for Wal-Mart, the Q4 always strong and stands out. The common way to deal with seasonality in the income statement is to use rolling annual sum, i.e. sum last 4 quarters. 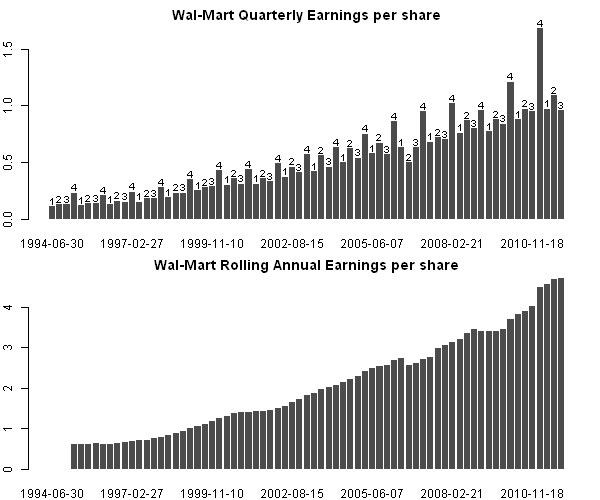 Next let’s align Wal-Mart prices and EPS and plot them on the same graph. Next let’s repeat the above steps for all companies in the Dow Jones index. It takes a while to download historical fundamental data for all companies in the Dow Jones index, so I recommend saving your results with save(data.fund, file=’data.fund.Rdata’) command. Later on if you want to run code one more time, just load(file=’data.fund.Rdata’) instead of downloading all data again. Next let’s create monthly factors. EP factor = (Earnings per share) / Price. VOMO factor = Volume x Momentum. Next let’s run correlation analysis for EP factor. You can do correlation analysis for VOMO factor as a homework. 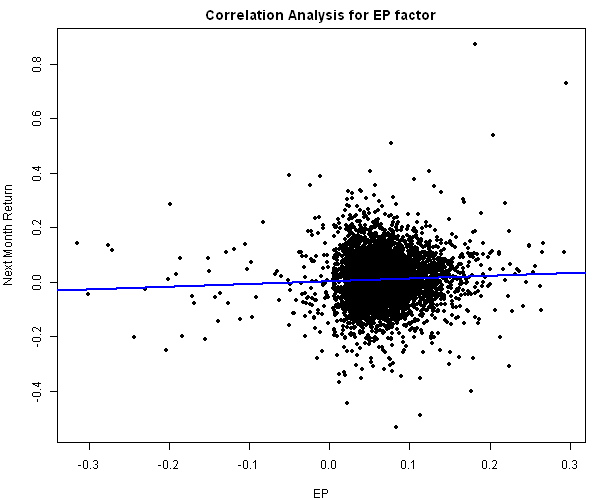 The correlation between EP and Next Month Returns is small, but significantly different from zero. The small correlation is not a surprise and is usual for this type of analysis. In the next posts, I will show that even this weak dependence can be profitable. To view the complete source code for this example, please have a look at the fm.fund.data.test() function in factor.model.test.r at github. THIS IS NOT INVESTMENT ADVICE. The information is provided for informational purposes only. 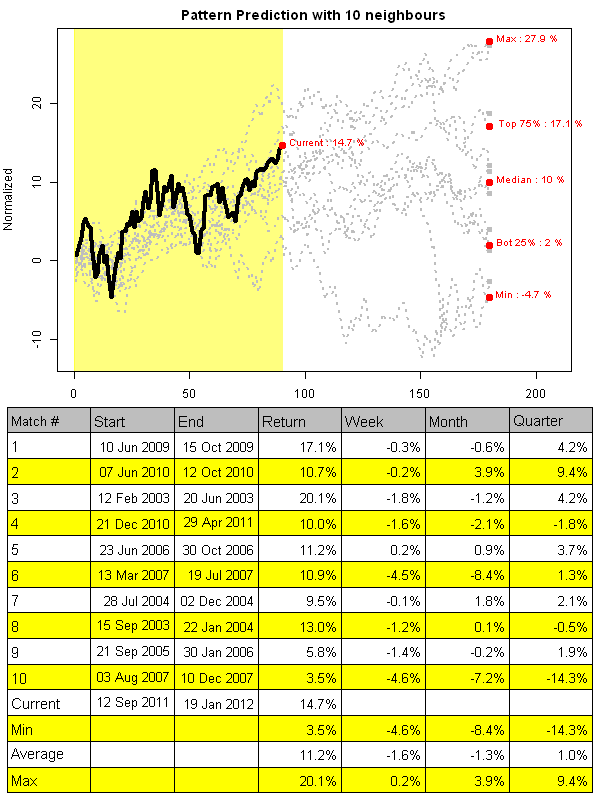 In the Time Series Matching post, I used one to one mapping to the compute distance between the query(current pattern) and reference(historical time series). Following chart visualizes this concept. The distance is the sum of vertical lines. 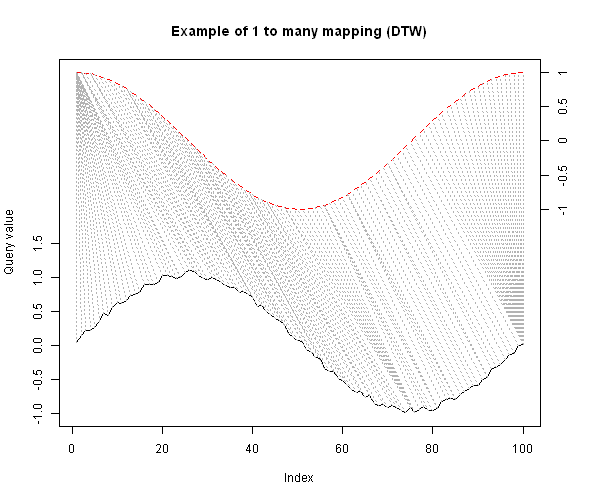 An alternative way to map one time series to another is Dynamic Time Warping(DTW). DTW algorithm looks for minimum distance mapping between query and reference. Following chart visualizes one to many mapping possible with DTW. 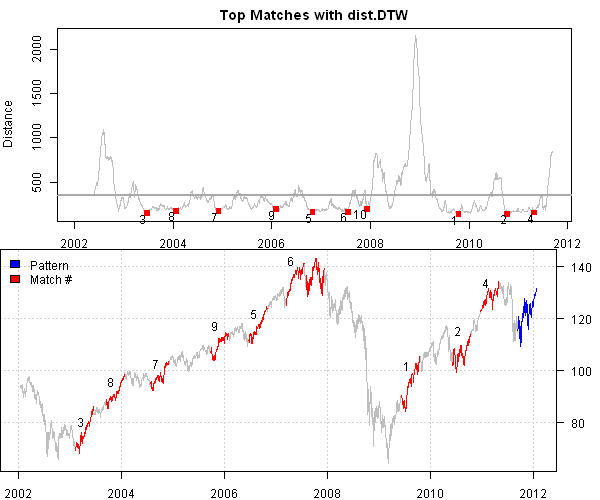 Next, let’ examine the top 10 matches using Dynamic Time Warping distance. I will use the Dynamic Time Warping implementation from dtw package. 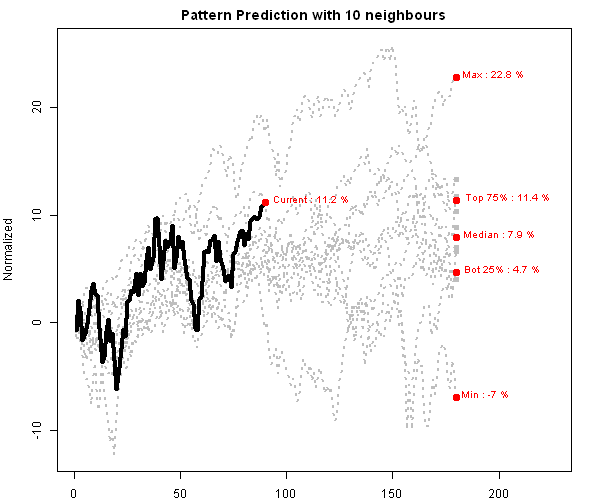 Both algorithms produced very similar matches and very similar predictions. I would use these predictions as an educated guess to market action going forward. So far, it looks like the market will not be going up in full throttle in the next 22 days. To view the complete source code for this example, please have a look at the bt.matching.dtw.test() function in bt.test.r at github. This is a quick post to address comments raised in the Time Series Matching post. I will show a very simple example of backtesting a Time Series Matching strategy using a distance weighted prediction. I have to warn you, the strategy’s performance is worse then the Buy and Hold. bt.matching.find – finds historical matches similar to the given query (pattern). bt.matching.overlay – creates matrix that overlays all matches one on top of each other. 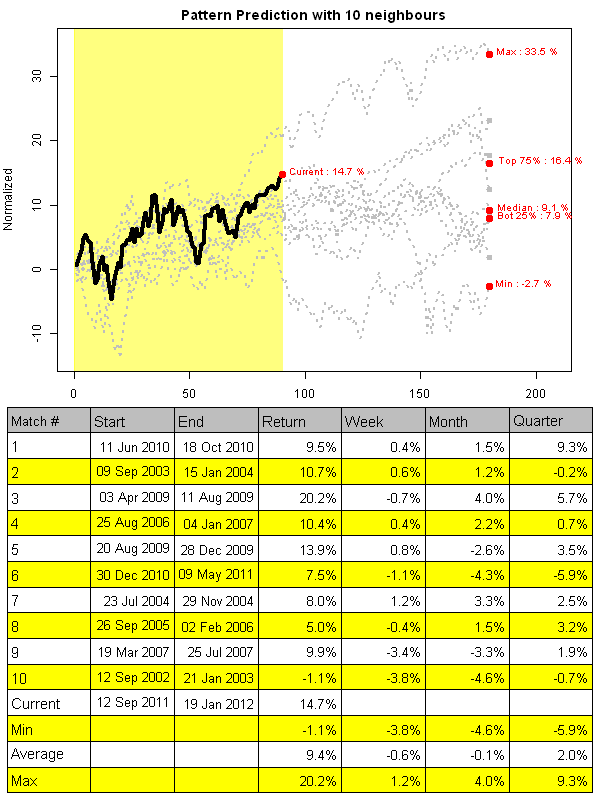 bt.matching.overlay.table – creates and plots matches summary table. 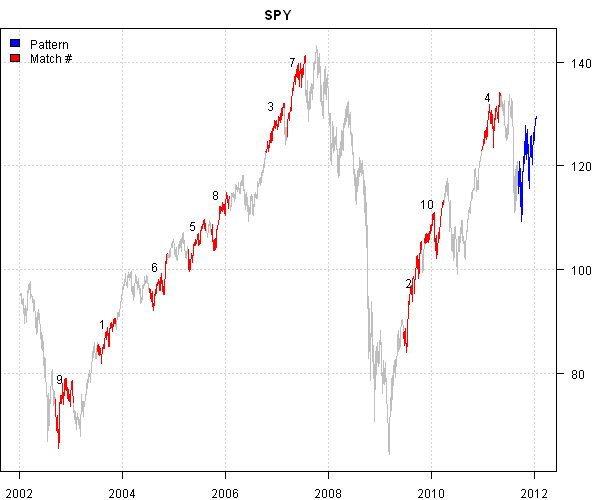 I will use historical prices for ^GSPC to extend SPY time series. I will create a monthly backtest, that trades at the end of the month, staring January 1994. Each month, I will look back for the best historical matches similar to the last 90 days in the last 10 years of history. I will compute a distance weighted average prediction for the next month and will go long if prediction is positive, otherwise stay in cash. This is a very simple backtest and the strategy’s performance is worse then the Buy and Hold. How would you change the strategy or backtest to make it profitable? Please share your ideas. I looking forward to exploring them. To view the complete source code for this example, please have a look at the bt.matching.backtest.test() function in bt.test.r at github. How to Accelerate Model Deployment using Rook by Jean-Robert Avettand-Fenoel. Introduction to Machine Learning Research on Time Series by U. Rebbapragada. 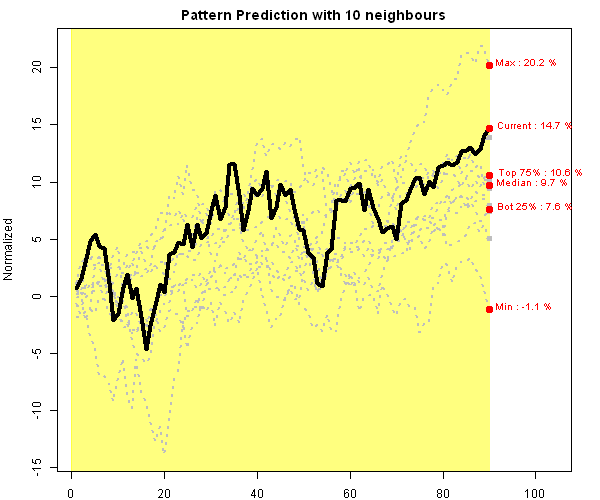 A practical Time-Series Tutorial with MATLAB. 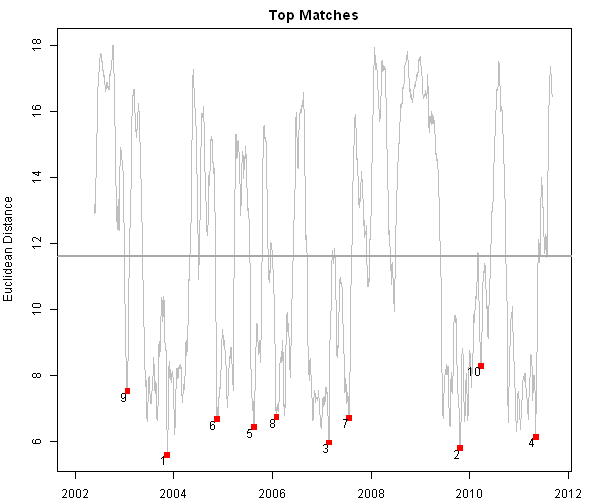 I will use a simple method outlined in the How to Accelerate Model Deployment using Rook by Jean-Robert Avettand-Fenoel article to find time series matches that are similar to the most recent 90 days of SPY. The Time Series Matching analysis can be used to make an educated guess what S&P 500 will do in the next week, month, quarter. This educated guess is based on historical data and there is no guarantees that history will repeat itself. In the next post I will examine other distance measures for Time Series Matching and I will show an example of Dynamic time warping. To view the complete source code for this example, please have a look at the bt.matching.test() function in bt.test.r at github. 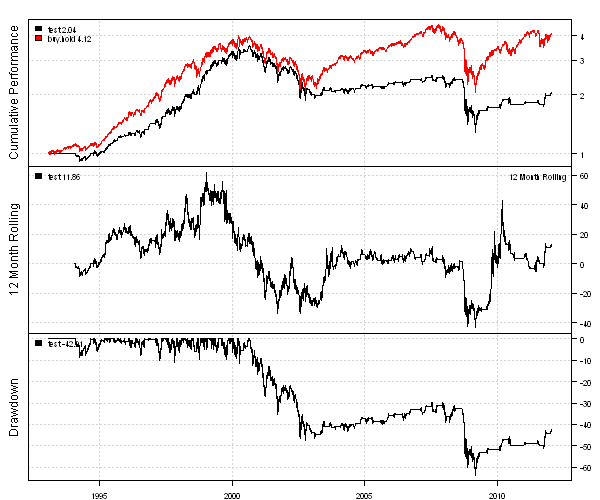 Quantum Financier wrote an interesting article Regime Switching System Using Volatility Forecast. 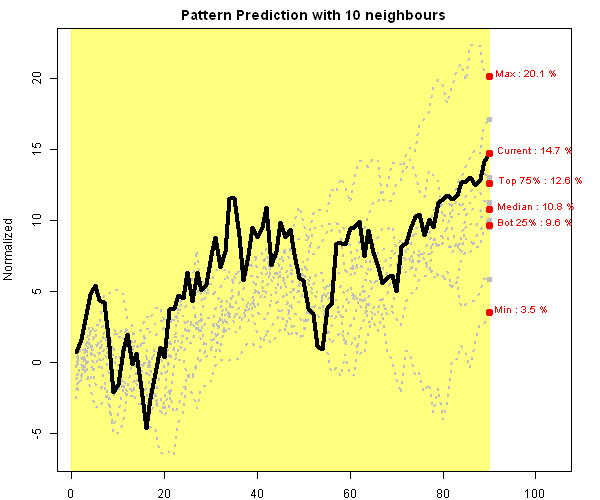 The article presents an elegant algorithm to switch between mean-reversion and trend-following strategies based on the market volatility. 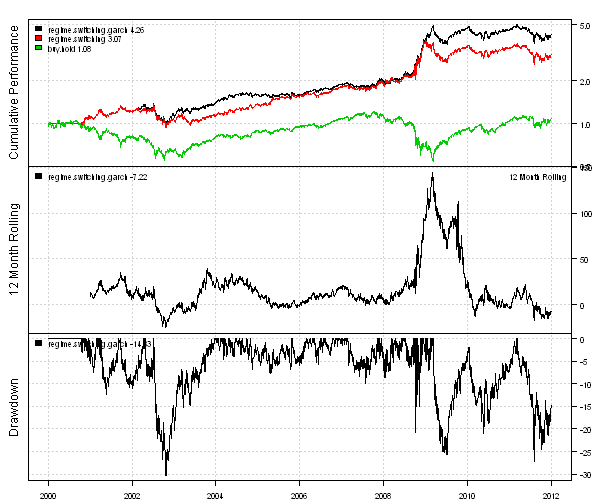 Two model are examined: one using the historical volatility and another using the Garch(1,1) Volatility Forecast. 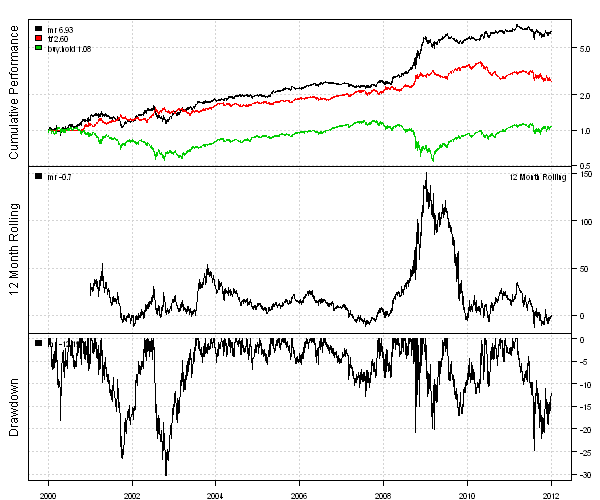 The mean-reversion strategy is modeled with RSI(2): Long when RSI(2), and Short otherwise. The trend-following strategy is modeled with SMA 50/200 crossover: Long when SMA(50) > SMA(200), and Short otherwise. 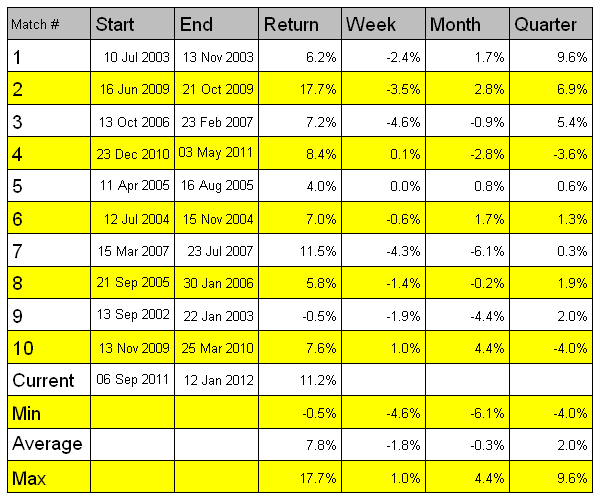 I want show how to implement these ideas using the backtesting library in the Systematic Investor Toolbox. Next, let’s create a strategy that switches between mean-reversion and trend-following strategies based on historical market volatility. GARCH(1,1) by by David Harper – a very good introductory article with lots of visual diagrams. 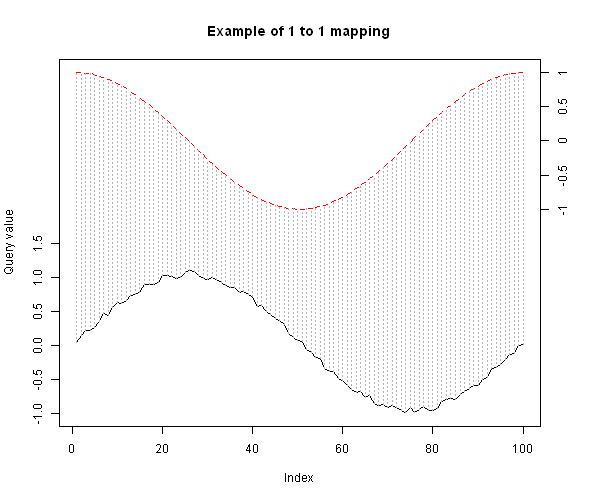 Practical Issues in Univariate GARCH Modelling by Y. Chalabi, D. Wurtz – step by step example of fitting GARCH(1,1) model with full R code. Basic Introduction to GARCH by Quantum Financier – is a series of posts that goes in to the details and assumptions of GARCH and EGARCH. The garchFit function is on average 6 times slower than garch function. So to forecast volatility I will try to use garch function whenever it can find a solution and garchFit function otherwise. Now, let’s create a strategy that switches between mean-reversion and trend-following strategies based on GARCH(1,1) volatility forecast. The switching strategy that uses GARCH(1,1) volatility forecast performed slightly better than the one that uses historical volatility. Market predictions for years 2011 and 2012 by Pat Burns – uses GARCH(1,1) to calibrate the significance of other people’s market predictions. 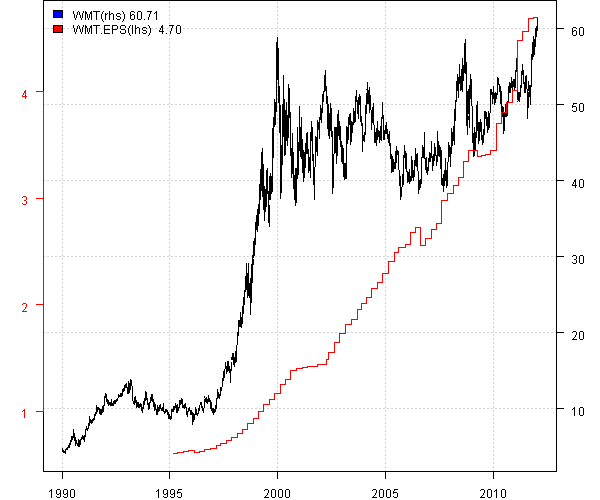 ARMA Models for Trading by The Average Investor – is a series of posts that shows how to forecast next day returns using ARIMA and GARCH models. 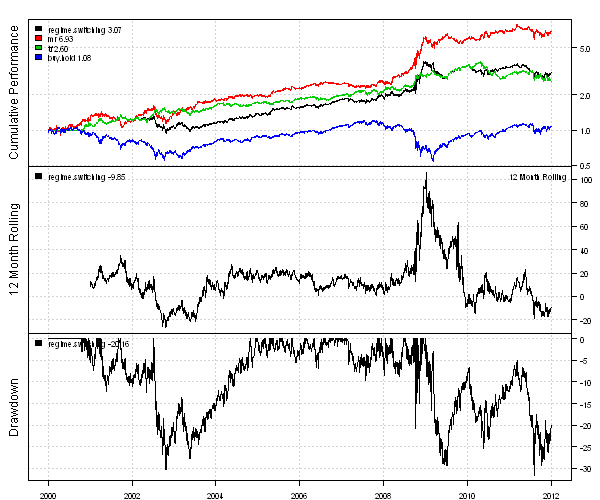 Wonderful New Blog TimeSeriesIreland at Timely Portfolio – uses EGRACH to create trading model. Forecasting In R: The Greatest Shortcut That Failed The Ljung-Box – uses ARIMA models to forecast GDP. To view the complete source code for this example, please have a look at the bt.volatility.garch() function in bt.test.r at github.